Sunquest Vacations is selling off some last minute charter airfares (the flights are actually operated by WestJet) from Regina to Cancun, Mexico for a ridiculously low price. 2. Click on 'Flights' under Book Your Vacation. 3. Search for a flight from Regina to Cancun, departing March 21 and returning March 28. Or, try March 20 to 27. The price may initially show as higher, but will drop on the verified price page. If you can't get to the verified price page without receiving an error message, the flight has sold out. 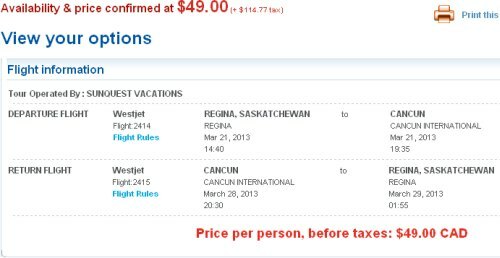 3 Responses to "Regina to Cancun | $164 roundtrip after taxes"
Wow great deal...I went on the site (2013-03-18 at 16:49) and it's true. Too bad I can't take days off.!!! Thanks for sharing I love your site! We booked 2 flights and found a 1 bedroom penthouse condo for $450 for the week! Can't find a cheaper holiday anywhere! Sorry we missed this deal to Cancun. Jamacia would be great. Waiting for the next one!!!! !